NEW Fenix RC40 2016 Edt- 6000 Lumens for your extreme outdoor adventures! This super high output performer has an ultra-long maximum beam reach of 2395 feet (730 meters). The dual side switch is flexible to control the five output modes, Strobe, and SOS. Included with the light is a tailored rechargeable Li-ion battery pack plus the charging and discharging port with a protective circuit. This battery is super efficient in battery charging and is also capable of supplying power for other digital devices. With its exclusive RAPID SCAN BEAM and excellent throw and coverage, this is sure to meet your field operations and more. It's 90-degree wide beam is perfect for maximum close-range coverage. 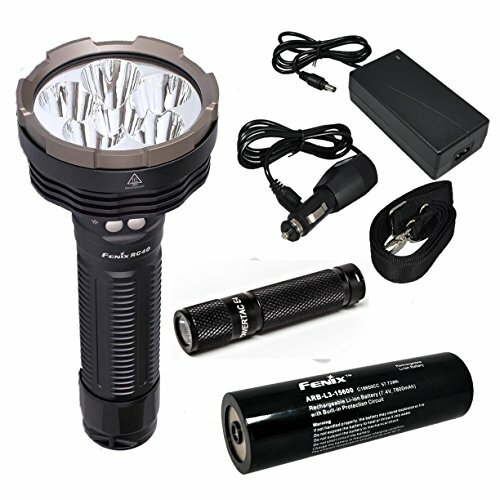 So the RC40 2016 is the light to turn to when you need a search and rescue light or a general high-performing light around the farm or on your hunting trip.